(If you celebrate Christmas) The hype leading up to Christmas begins following Thanksgiving day, which means it lasts a whole month. We decorate our homes by putting up our tree, buy and wrap gifts, plan for celebrations, and prepare lots of food. It is a holiday of love and cheer, but also requires a lot of work to plan for. By the time it’s over, we can breathe again. After a hectic month, some of us aren’t ready to take the decorations down right away. I’ve left mine up for a few months following Christmas, and I’m sure I’m not the only one. Some of us might be so tired of the holiday that the decorations come down right away. Are you superstitious? 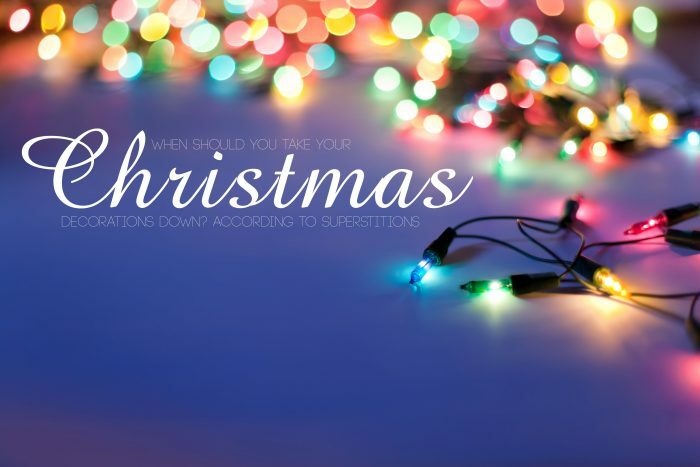 For those who are superstitious, apparently, there’s a “right time” to take down your holiday decor. There is a tradition that states that the Christmas decorations should be taken down on the Twelfth Night, which falls on January 5th. No sooner, no later. If it isn’t done on January 5th, it’s considered bad luck to take them down at all. Instead, it’s said that you should leave them up all year round. The “Eve of the Epiphany” lands on January 5th, which is observed as the last day of Christmas festivities. The next part is. . . interesting, to say the least. Often, people use holly and ivy to decorate their homes for the holiday season. Hundreds of years ago, it was believed that “tree-spirits” lived in the greenery used as decor. It was said that the festive, holiday spirit provided shelter for the “tree-spirits” during the winter. Once the holiday was over, they needed to be released outside. The superstition was that if the custom wasn’t followed, there would be agricultural problems. However, nowadays, most Christmas decor comes from China, and is made of plastic, instead of using fresh foliage. There are still some superstitious people that follow this tradition. According to Christian beliefs, January 6th is the “day of the Epiphany”. This was the day that Christians believed that the Magi arrived in Bethlehem with the gifts for Jesus. The three kings were following the Star of Bethlehem for navigation. It was a Christmas tradition to tell children that if you took down your holiday decorations before this day, the wise men would not be able to find their way. The Christmas lights were a metaphorical Star of Bethlehem. This tradition is common in Europe.